First there was standard definition, then there was HD—and now there’s 4K UltraHD. 4K is quickly becoming the standard resolution option for televisions, especially for higher-end versions from the top companies. Getting that same level of resolution from a projector has historically been a very costly endeavor. As the technology becomes more widely available, though, the price of getting it in your own home has dropped, and you can now find 4K projectors that are actually affordable for your average consumer. But what’s the best 4K projector under 2000 dollars? We’ve sought to answer that question by reviewing four of our favorite choices on the list below. Read on to see which one we think is the overall best—and to find the perfect projector for your home theater. 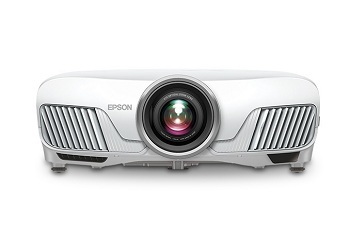 Let’s start by looking at this impressive professional-level projector from Epson. As with all of the projectors we’ll look at on this list, it gives you impeccable performance across the board, but the most impressive feature is definitely its color accuracy and selection. It uses a wider color gamut than most televisions, bringing its color selection options up to the standards of a professional cinema. It also uses 3LCD technology that eliminates the concept of a color wheel, giving you a more subtle and accurate 10-bit color selection. The other aspects of the display are equally professional and well-made. The native contrast ratio is especially impressive. It can reach contrast levels up to 140,000:1, a much more impressive ratio than you’ll find on other options. This affects the intensity of the colors as well as the depth of the black spaces that makes those colors pop more. In terms of brightness, the lamp will generate up to 2,200 lumens—not enough to use in bright daylight environments, but plenty bright enough for you to see in rooms that use normal indoor lighting. The Epson Home Cinema 4000 also scores high marks for versatility. There are 10 preset positions for saving the focus and zoom settings. The lens is also motorized and uses smart technology so it’s easier to set it correctly to suit your screen and space. While it has native 4K UltraHD support, that doesn’t mean you’re limited in the kind of content you can watch. Even content in 1080p resolution (>>> Our top picks of 1080p projectors) will look better on this projector than it does on other devices. All told, this might be on the best projectors under $2,000 if versatility and color quality are your main considerations. 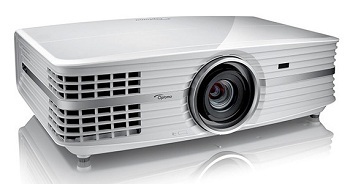 Optoma is another brand you’ve probably heard the name of if you’ve shopped for projectors before. They make a range of different projectors that are great for home use, one of which is this impressive 4K model. It not only gives you a brighter lamp and better contrast ratio than the Epson above, but it also costs a few hundred dollars less—definitely a strong contender for the best-valued 4K projector. The lamp on this projector uses some of the most advanced technology you’ll find on the market. The DLP chip system means you don’t have to do anything to align or set up the picture. The image you get will be sharp, clear, and detailed as soon as you unbox the projector, no matter the specifics of your viewing area. With a throw ratio of 2.22 (>>> Find out everything about top short throw projectors) and a screen as big as 140”, along with vertical lens shift that makes it more flexible for different installations, it is a great option for big screen viewing in pretty much any circumstance. The most important thing is how the image looks, and this projector definitely looks great at any size and for any resolution. This is largely thanks to the UltraDetail technology that adds sharpness to the picture for impressively realistic images, no matter what the resolution of the content. The 3,000-lumen brightness ensures you’ll be able to see that impressive image in any lighting conditions. Optoma UHD60 4K Projector Definitive Review – Almost Perfect! Most companies that have been working toward new innovations in projector technology focus on improving the projected image more than the physical object of the projector. While this is arguably the more important aspect of a projector, there’s something to be said for improving the design. Where many high-end projectors are bulky, heavy, and difficult to install, the HT2550 from BenQ is surprisingly sleek and slim. This means it weighs less and takes up less space, making it easier to situate it in any room or situation. 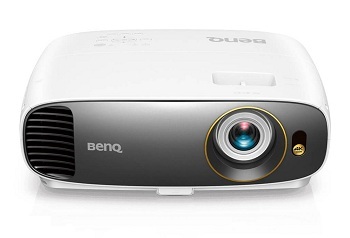 Along with being one of the easiest home theater projectors to set up, this BenQ model also requires almost nothing in the way of maintenance. The lamp has an average life of over 15,000 hours, nearly ten times what you’ll get from entry-level projectors, which could mean you never need to change it depending on how often you use your projector. The projected image from this BenQ model is pretty incredible too, of course. It has HDR10 support and a proprietary auto HDR color system, along with a true 4K UltraHD resolution. There’s a 1.2x zoom to make the best use of your space, giving you a clear image up to 200” wide depending on your placement. If what you want is a combination of ease and performance, this could be the best 4K projector for you. Finally, we’ll bring another model from Optoma to your attention. It also happens to be the least expensive option on this list, over five hundred dollars cheaper than the first model reviewed above. ( >>> Our guide of best cheap projectors ) If you’re already looking in this price range that’s likely not as important to you as the performance, but then again there’s no reason to spend more if this one gives you all the features you’re looking for. The stats on this model are certainly quite similar to other projectors that cost hundreds of dollars more and can be a great way to get 4K resolution at a great value. Let’s start with those stats we mentioned. 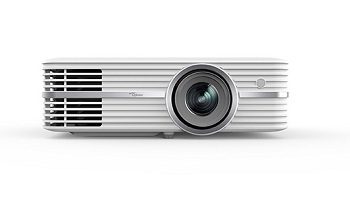 The lamp in this projector can give you up to 2,400 lumens and it takes advantage of the same HDR10 technology that you’ll get with the pricier models in the Optoma catalog. It also gives you true 4K UltraHD and a contrast ratio of 500,000:1—not as high as some of the models on this list, but plenty to give you vibrant colors and deep, dynamic blacks. What’s really impressive about this projector, though, is that it’s a high-performance system with very fast operation. There’s virtually no lag, meaning it will work just as well for gaming as it will for watching movies and TV shows. The sharpness of the image and flexibility of the zoom and lens shifting functions make it an ideal all-purpose projector, suitable for every application in your home. We like all four of the options on the list above, honestly, and each for different reasons. In terms of our overall pick for the best 4K projector under 2000 dollars, though, we have to go with the Optoma UHD60. It’s one of the more affordable options on the market, but as great as that is it’s not the main reason we picked it. The Optoma UHD60 is a powerful projector with a fantastic image quality that’s easy to install and use—the perfect model for any home theater. The truth is, though, you could make an argument for any of these four being the best projector in the price range. Whichever way you go, you’ll get true 4K resolution at any size—and for a great price. Next articleGray vs White Projector Screen: Which One’s Right for You?